Last week I went to one of my favorite spots in the East Bay to find blewits, a lovely purple mushroom that smells like lilacs and tastes a lot like regular button mushrooms. I’d found them at this spot last year, and since we finally got some rain the week before, I thought I’d have plenty to show the foraging class I was to teach that night at the Vacaville Public Library. But as I walked around the area, I noticed something: No mushrooms. None. Not even LBMs, the Little Brown Mushrooms few of us can identify. Weird. I went right for the area I knew I should find blewits, but they were not there. The only thing I found was a shabby little suillus; edible, but certainly nothing to write home about. I picked it and put it in my pack. At least I’d have something to show the class. I wandered over to a grove of old oaks. I’d seen agaricus mushrooms there in the past, and maybe they’d be around this time. But again, nothing. Damn. I was standing there, looking around, when I caught a flash of orangey-gold at my feet. No way. Couldn’t be… I bent down and brushed away the duff. What the hell? Chanterelles? Huge ones, too! I could not believe my eyes. I cut one to make sure. Looked like a chantie. 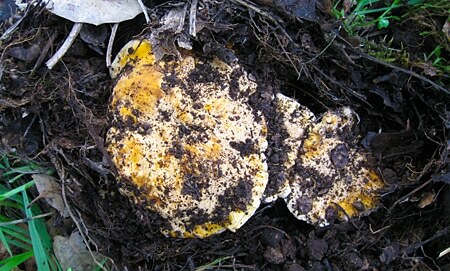 I smelled it, and inhaled that citrusy apricot aroma all chanterelle lovers adore. Definitely a chantie. I furtively stuffed the mushrooms into wax bags in my pack, then looked for more. All around me I saw mushrumps, lumps in the duff where the chanterelles were pushing up. A secret bonanza! I was bending down to cut another when a biker rode by. “Looking for mushrooms?” he asked. Yep. “Find any?” I told him it was pretty grim, that I’d found one or two but that was it. So there you have it: I lied to feed my lust. It gets worse. I had half my pack filled when an elderly couple walked up the trail toward me. I’d spotted them a fair distance away, so I stopped what I was doing, pulled out my cellphone and pretended to send text messages. I kept a close eye on them as they ambled past. Only when they were long gone did I continue picking. Try not to think ill of me. Even though the pursuit of food from the wild is an inherently uplifting and hopeful endeavor, it can also evoke the darker side of our nature. There is not an angler, hunter or forager among us who has not lied — or at the very least obfuscated — when asked about our favorite spots. If I had to put money on it, I reckon that the first lie ever told, eons ago, was about where the good hunting grounds were. Why lie? Because way back when, our band/tribe/clan’s survival might have depended on it. Our success in the field depends on having spots that are either so rich that they cannot easily be depleted, or are kept secret enough so that only a few know their whereabouts. If I told you where my chanterelle spot was, you could go there and pillage it the way I very well might have to the dude who told me about the spot in the first place. Did I betray him by picking those chanties? Not the way I see it. If he’d told me that it was his secret spot for chanterelles, and to respect that, I would have. But if he knew that chanterelles grew there, they were so precious to him that he lied about it, too. A vicious circle. Lies or no lies, it was an awesome haul, at least for me. In less than an hour, I’d picked 6.5 pounds of very large, very firm chanterelles. Absolutely beautiful mushrooms. The first thing I did when I got back was make a big batch of pickled chanterelles. Chanterelles do not dry very well, so you need to either pickle them or cook-and-freeze them if you want to preserve your haul. I gave some to my friend Elise, and am planning to use a bunch of them for a wild duck jaeger schnitzel this weekend. But I had to cook some right away. 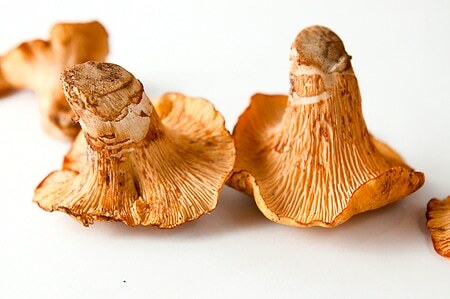 I’ve been toying with a particular chanterelle recipe for months now that stems from a dish of chanterelles, pasta and pine nuts I ate at Incanto in San Francisco. I tried to replicate it first with orecchiette pasta. It was good, but not great. I then ditched the pasta and made a version with white polenta I’d gotten from my friend Scott at the Sausage Debauchery. That dish was great. So I’d planned on posting that version here at some point, but when I saw how deeply golden-orange this batch of chanterelles was, I thought I’d play with the color and serve it not with white polenta, but with pumpkin spaetzle. To that I added homemade guanciale, pine nuts from Nevada, butter, onions, garlic and parsley. A wonderful plate of food. Lots of different textures and colors, highlighted by the bright orange of the chanterelles and the muted yellow-orange of the spaetzle. A tiny splash of sherry vinegar at the end brightened everything up. I suppose I could have plated it super fancy-like, but Holly and I just wanted big bowls of the stuff. We ate more than a pound of chanterelles at one sitting — and that ain’t no lie. This is a recipe to celebrate the chanterelle, but if you use other mushrooms the world will not end. 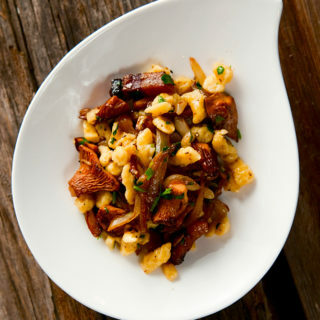 I like the play of orange-and-orange from the chanterelles and the pumpkin spaetzle, but you could use store-bought or another spaetzle recipe if you don't have pumpkin or squash puree handy. And in the absence of guanciale, get thick-cut pancetta or bacon. The essence of this dish is the play of flavors and textures. Chewy, meaty cured pork, savory and aromatic chanterelles, soft, rich spaetzle, the dense chew of the pine nuts, plus a touch of bitter from the parsley and sour from the sherry vinegar. Have all your ingredients ready because the dish comes together fast. Melt the butter in a large saute pan over medium heat. Add the guanciale batons and fry slowly until crispy. Remove and set aside in a bowl. Add the onion slices, turn the heat to high and saute until the edges begin to brown. Add the garlic and cook another 30 seconds to a minute; don't let the garlic burn. Remove the onions, garlic and excess butter into the bowl with the guanciale. Put the mushrooms into the pan and cook them over medium-high heat until they give up their water. This may take a few minutes. My chanterelles were pretty wet inside, so I got a lot of water. When it is mostly boiled away, add back the guanciale, onions and garlic (with the fat in the bowl), plus the pine nuts and spaetzle. Toss to combine and cook for 1 minute. Mix in the parsley and cook another minute. Serve hot in bowls with some black pepper and a splash of vinegar. This looks like a killer way to show off chanterelles. 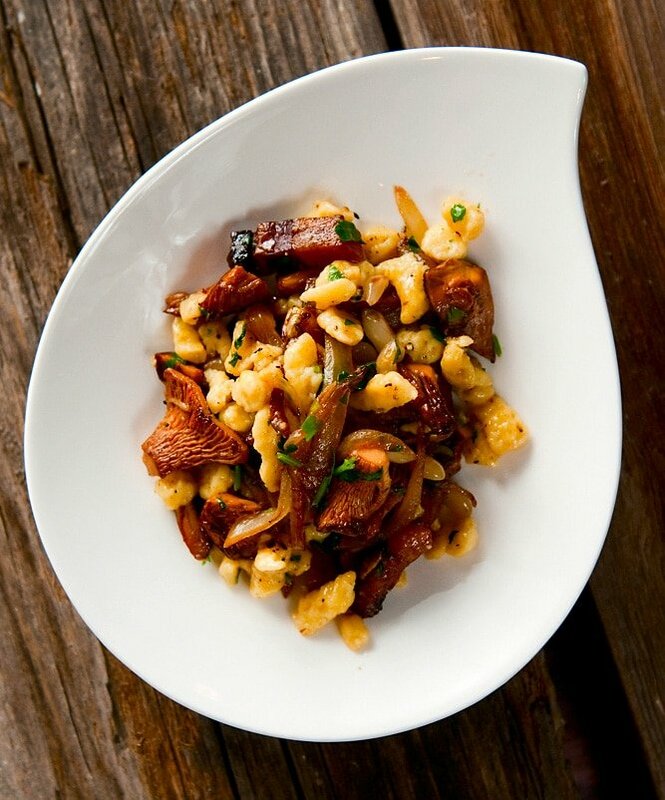 Been meaning to make spaetzle so I’ll give this recipe a try. Oh my, this makes my mouth water. I must learn how to forage for mushrooms. Looks like you stumbled into the “East Bay Mud Puppy” flush! Usually some of the biggest chanterelles to be found in Ca.